The recent Good Food and Wine show dominated the July Food calendar in Johannesburg. As the name suggests, it’s all about food and of course, what we should be drinking with it. Pulling in the crowds were a group of passionate chefs and culinary creatives who constantly inspire new ways of cooking and eating. There’s no doubt as to the popularity of Masterchef, a platform that offers food enthusiasts the opportunity to showcase their food skills and step into the competitive food arena. Who better than George Calombaris to lead the way at the recent Johannesburg GFWS? I had the privilege of attending George’s chefs table where he chatted about food memories and how they translate into modern culinary interpretations. Respectful use of local ingredients and seasonality are key considerations when creating new dishes. Following the sublime (there’s no other word for it), three course tasting menu, I obviously had to buy his new book, Greek. Can one ever have enough cookbooks? Cleary not. The food is insanely delicious and beautifully photographed. The recipes are rooted in Hellenic culture and melded with contemporary flavours. Just spectacular. I could eat the book! Of course we also had our team of local South African food masters and chefs cooking mouthwatering dishes over the course of three days. Claire Allen, SA Masterchef finalist, kept foodies salivating and well fed. 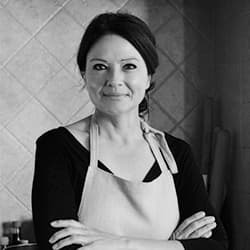 Claire currently spends most of her time hosting cooking demos in Cape Town, running her events company and blogging at Food is Love. She also forms part of the Short Chef Skinny Chef duo along with Chef Sipho. I conducted a short Q&A with Claire on how the Masterchef experience has changed the way she cooks, Sunday lunch and what’s hot to make right now with miso. Today’s recipe was inspired by George’s book and the lively flavours that define Greek food. It’s social, relaxed and meant for sharing. 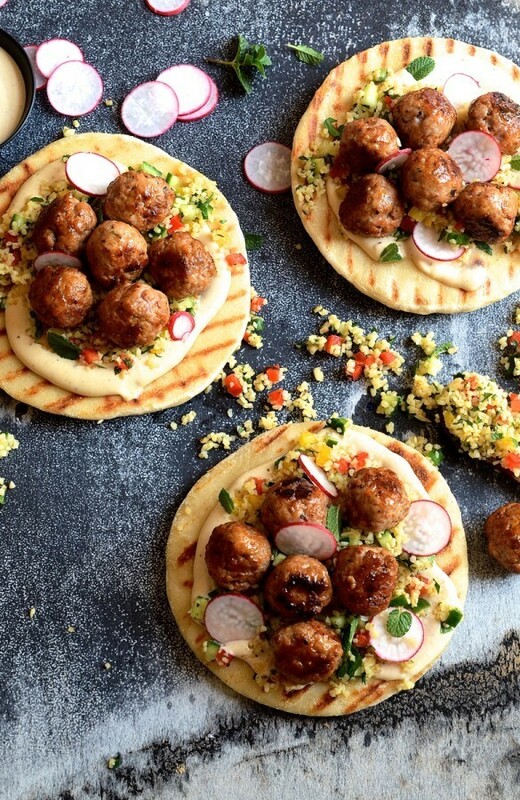 Roll up your sleeves and let’s tuck into these Pork meatball pitas with miso and tahini yoghurt. Sounds Greek and delicious right? It is! If you haven’t yet tried miso, you’re missing out. Although Asian in origin, it’s used to add depth of flavour to many sauces, soups and dressings. I’ve combined it with tahini and Greek yoghurt for a spoon-eating luscious dressing. 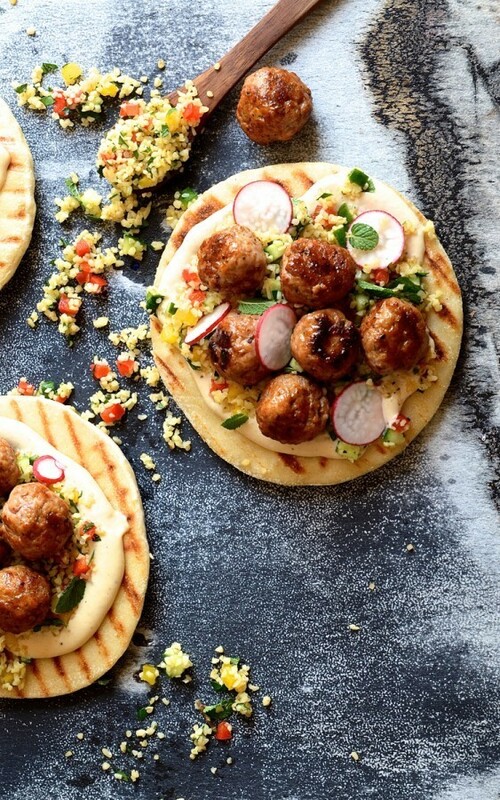 It cuts through the richness of the pork and adds a creaminess to the pitas. I like to serve the pitas with my tabbouleh inspired bulgur wheat salad and crisp pink radish wafers for freshness and crunch. SO good! 1. Being surrounded by food creatives and experienced chefs on Masterchef SA it’s impossible not to be inspired. What for you was the most valuable advise or take away from the show? During Masterchef and over the past two years I have been exposed to some incredible chefs and there is a common theme of respecting your ingredients, the natural flavours and simple cooking processes that allows food to come to life. How has competing in Masterchef SA changed the way your think about and cook food? I am a lot more strategic when I cook, ensuring I’m always planning ahead and that I make the best choices with my list of ingredients, cooking process and ability to reduce waste. Obviously you spend loads of time cooking for others. When you eat out, what are the three most important things you look for? Comfy chairs, a warm and inviting atmosphere (good music and a fire place or aircon depending on season are so important) and a good wine menu – these three things can really make or break evening out. Food trends come and go. Do you think it’s important to follow trends and which current trend, if any, do you think is worth keeping? I personally don’t like trends or fads. I cook like my mom and gran cook but I do believe it’s important to look at what the market wants and needs and currently there is a huge move to more plant-based and vegetarian dishes so I am looking into understanding this more and ensuring I can give people some delicious options. Food, love and people are a close fit. What is it about this combination that makes sharing a table most memorable for you? Looking over the table, hearing the laughs, clanging of glasses and watching the people I love enjoy a meal that has brought us all together. This is the corner stone of why I love food so much – food is love. Traditional South African foods are constantly being given a fresh new twist. Growing up, what was your favourite local food that you still enjoy eating today? Three things you should absolutely make with miso. Miso soup, miso chicken and sesame miso dressing is amazing on salad. It’s Sunday lunch. What’s on the menu? Granny’s roast chicken with stuffing, roast potatoes, gravy, pees and carrots. Ash food. In or out. I just Googled what it is and have to say I need to do more research. Best music to cook to. I’m an 80’s baby so I’ve always got a few classics on my iPod, blasting in the kitchen. The Good Food and Wine Show takes place in Durban at the end of October. Place all the ingredients for the meatballs in a bowl and combine. Measure out heaped teaspoon amounts of the meat mixture and roll into balls. Heat a tablespoon of olive oil in a non-stick pan and cook the meatballs until browned on all sides and cooked through. For the miso yoghurt, combine all the ingredients in a bowl and whisk until smooth. Brush the pita breads with olive oil and heat in a griddle pan. 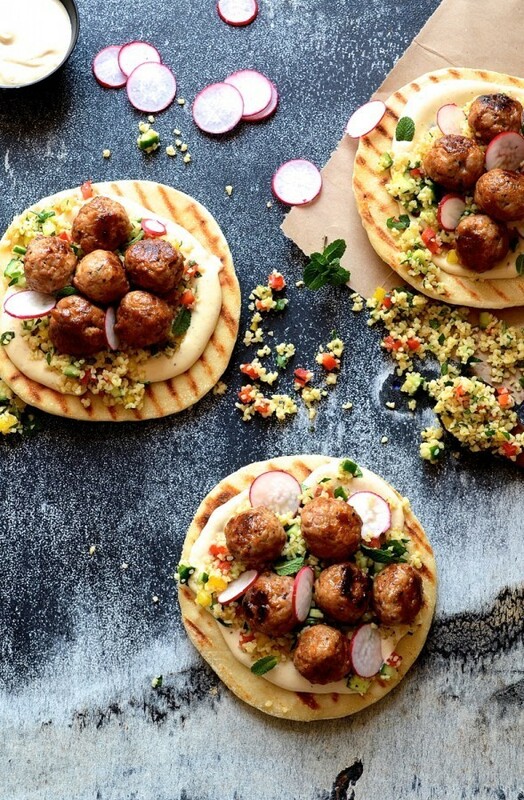 Dollop a heaped tablespoon of miso and tahini yoghurt on each pita base. Top with tabbouleh, pork meatballs and radish wafers. Finish with fresh mint and serve immediately.